This four-part Excel VBA course provides participants with the skills needed to incorporate Visual Basic for Applications (VBA) into financial models. This VBA module series will be particularly valuable to those who regularly build financial models in Excel and are looking for a thorough introduction to VBA. 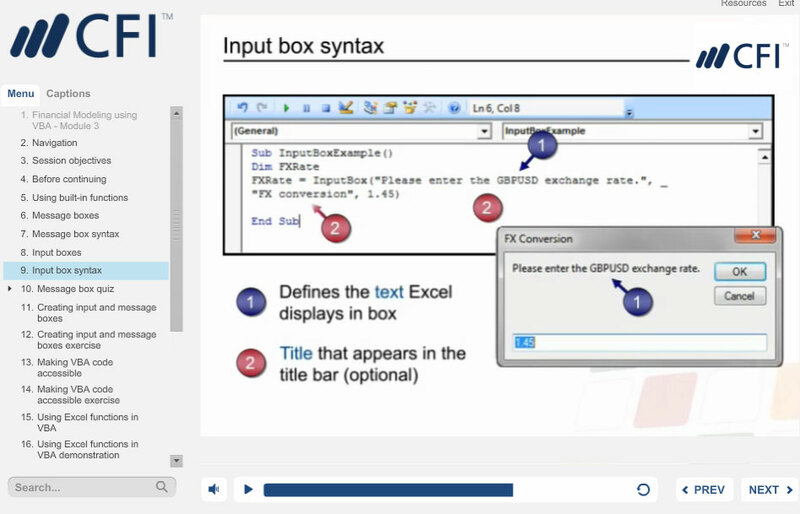 In this first module, we explore the benefits of using VBA in financial models, outline how to navigate around the Visual Basic Editor Window and record a wide range of macros. By the end of this module, you will have a solid understanding of VBA Excel principles and how to record macros using absolute and relative referencing. In this second section of this Excel VBA course, we cover how to create sub procedures using objects, properties, and methods. 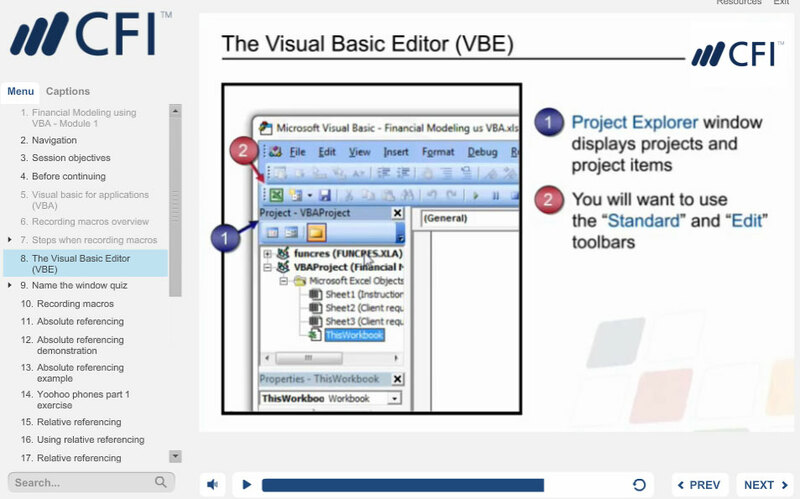 By the end of this module, you will be able to design, build and run VBA sub procedures. 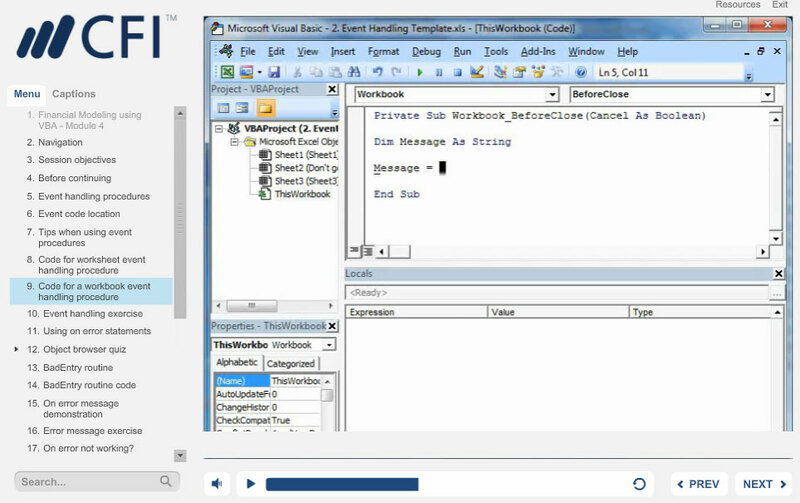 In this third section of the course, we cover how to create and use functions in VBA code. By the end of this module, you will be able to take advantage of a wide range of VBA functions, incorporate Excel functions into your VBA code and create customized Excel functions. In this fourth module we cover how to write branching and looping code. By the end of this module, you will be able write branching and looping code, create event handling procedures and use “On Error” statements. 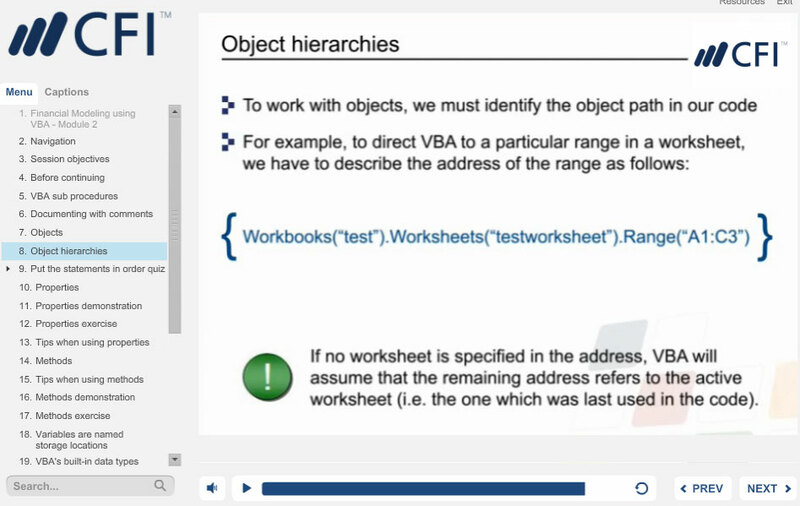 This section of the Excel VBA course incorporates sophisticated search and navigation tools that allow you to go at your own pace while pop quizzes get you to test what you have just learned. This module includes several Excel-based case studies and solutions as well as a PDF - VBA reference guide - that can be used while taking the course and downloaded to your computer for future reference. Who should take this Excel VBA course? This Excel VBA course is designed for professionals working in a wide range of finance and accounting positions. It's ideal for anyone who wants to use VBA to enhance their Excel skills. This is my first time programming in VBA. I found the introductions and course material very good and learned a lot from the hands-on examples. I have not seen any other courses on VBA with financial modeling before - super interesting to understand how you use VBA in your Excel model.